The Muskegon Middle School building should remain open, school traffic congestion must be addressed, and seventh and eighth grade students should not be moved to a facility close to the high school, community members said Monday evening at Muskegon Public Schools’ first town hall meeting on preliminary plans for an approximate $77 million bond. The bond—which would replace the current 30-year bond that expires in 2021 and would not increase taxes—is needed to attract and retain students and address deteriorating infrastructure in aging buildings, educators and community leaders say. The public would vote on the bond in May 2020. About 40 people gathered at Muskegon Middle School for Monday’s town hall on four possible bond plans, all of which were created by a steering committee that included school administrators, educators, government officials, Board of Education members, and other community leaders. TowerPinkster, an architecture and engineering firm based in Grand Rapids, has been hired by the district to help craft the bond plans. Another community meeting on the bond will be held Wednesday, March 27, at 6pm at Lakeside Elementary (2312 Denmark St.). To see the presentation given Monday evening, you can click here. “We’re not asking for more money, just a continuation of what you’re already paying,” Muskegon Public Schools Superintendent Justin Jennings said at Monday’s meeting, referring to the taxes residents pay as part of the current 30-year bond. The four bond proposals include plans to close schools in order to address decreasing enrollment trends. 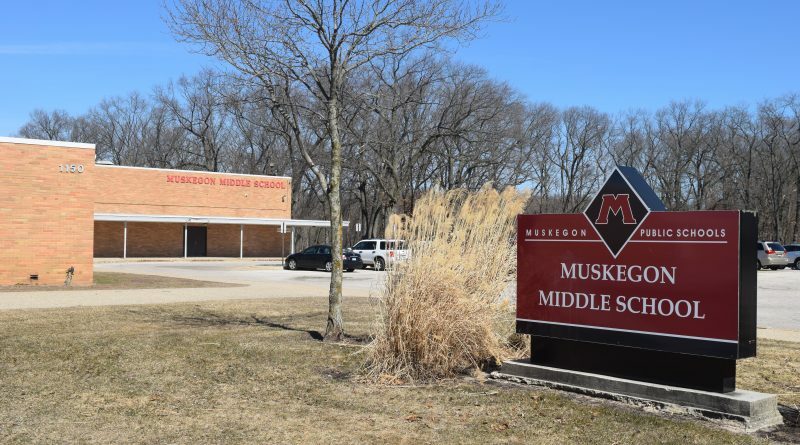 The number of K-12 students in Muskegon Public Schools has significantly dropped over the past 25 years. In 1995, there were 7,135 students in the district, and about 5,300 students attended the district in 2008. In 2018, the district had 3,611 students. 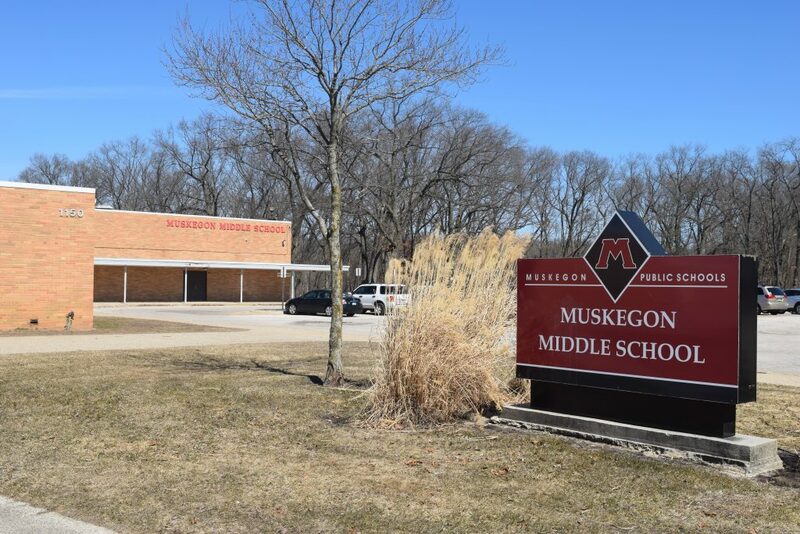 Under the four bond plans, the district’s administration would move from their current offices in the downtown Hackley building to Muskegon High School. The bond money would allow the district to better address school safety; replace heating systems, roofs and windows; upgrade restrooms and playgrounds; create clear entrances and exits; improve parking lots and parent/bus drop-off areas; provide cosmetic refreshments; install LED lighting; and more, Jennings said. None of the four plans are set in stone and can be altered prior to the May 2020 vote. The district will accept input from both of this week’s community hearings, potentially alter the bond plans with that input in mind, and hold a final town hall around the end of April. “We know we can’t educate students the way our buildings are now,” Jennings said in the previous interview with the Muskegon Times. “With the bond process, we want to look at what the future of Muskegon will look like academically; we’ll build buildings around what we want academically and what we want it to look like for the future,” Jennings continued. Have 650 kindergarten through fourth grade students at Oakview Elementary. Add 16,800 square feet at Oakview Elementary. Have 650 kindergarten through fourth grade students at Glenside Elementary. Add 32,380 square feet at Glenside Elementary. Have 750 fifth and sixth grades and two-way language immersion program (TWI) students at Nelson Elementary. Add 70,200 square feet to Nelson Elementary. Have 550 seventh and eighth grade students at a new, 91,800-square-foot building next to Muskegon High School. Have 1,000 ninth through 12th grade students at Muskegon High School. There will be no added space at the high school. District administrators would leave the Hackley building and move their offices into Muskegon High School. The following schools would close: Muskegon Middle School, Marquette Elementary School, Moon Elementary School, and Lakeside Elementary. 650 K-4 students at Oakview Elementary. Add 16,800 square feet to Oakview Elementary. 650 K-4 students at Lakeside Elementary. No added space at Lakeside. 750 fifth and sixth grade and TWI students at Nelson Elementary. 550 seventh and eighth grades students at a new 91,800-square-foot building by the high school. 1,000 ninth through 12 grade students at Muskegon High School. No added space to the high school. Move district administration from Hackley to the high school. Muskegon Middle School, Marquette Elementary, Moon Elementary, and Glenside Elementary would close. 775 K-5 students at Lakeside Elementary. Add 3,840 square feet to Lakeside Elementary. 775 K-5 students at Muskegon Middle School. No added space at the middle school. 1,050 sixth, seventh and eighth grade and TWI students at Nelson Elementary. Add 78,300 square feet to Nelson Elementary. 1,000 ninth through 12th grade students at Muskegon High School. No added space at the high school. Move district administration to the high school. Close Marquette Elementary, Oakview Elementary, Moon Elementary, and Glenside Elementary. 800 K-6 students at Lakeside Elementary. No added space at Lakeside. 550 K-6 TWI students at Marquette. No added space at Marquette. 450 K-6 students at Nelson Elementary. 800 seventh and eighth grade students at the J building, located on the high school’s campus. Add 52,515 square feet to the J building. Close Moon Elementary, Glenside Elementary, and Muskegon Middle School. Of the above plans, the majority of those attending Monday night’s meeting backed the third option, which keeps the middle school building open and does not place seventh and eighth grade students in a new building close to the high school. Additionally, a number of attendees at Monday’s meeting said they would support an increase in taxes to fund the city’s schools. While Jennings said if the community “overwhelmingly” decided they would back a tax increase, the district may consider it, but he emphasized they are currently focused on passing an approximate $77 million bond that would not increase taxes. Other members of the steering committee too emphasized the importance of passing the bond, as opposed to rallying for a tax increase. The proposed bond is a 7-mill bond, which translates to $7 on each $1,000 of a property’s taxable valuation. The current bond that expires in 2021 is also a 7-mill bond. Lowell Kirksey, who lives in the Nelson neighborhood, said he hopes the bond will address serious traffic congestion issues in the area—a sentiment that was echoed by a number of others at Monday’s meeting. “During the day, when schools are let out, there’s so much congestion on Southern Avenue that you cannot get through there, and that extends down Jefferson and along Sanford,” Kirksey said. Attendees at Monday’s meeting said they did not support building a school for seventh and eighth grade students by the high school and cited concerns about the age difference between those students and the high schoolers. No one spoke in favor of placing the seventh and eighth grade students in a building by the high school. “I just don’t feel safe with that,” said Shawndra Sain, a counselor at Muskegon High School who has children in the district. Sain and other audience members said they support keeping the Muskegon Middle School building open, and the high school counselor emphasized she supports a bond proposal in general.